Thabo Sefolosha not guilty: NBA guard broke leg during NYPD arrest in April. 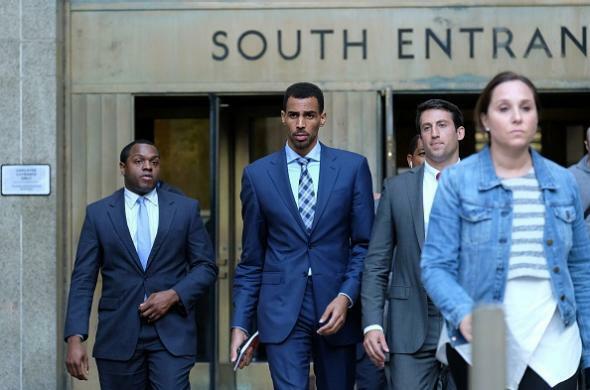 Thabo Sefolosha leaves a courthouse in New York City on Oct. 7, 2015. A jury in Manhattan has found Atlanta Hawks guard Thabo Sefolosha not guilty on three charges related to his arrest on April 8 outside a nightclub for allegedly interfering with NYPD officers at the scene of a stabbing. Sefolosha, 31, reportedly suffered a broken leg during his arrest and has said he was injured by police officers; before his trial he rejected prosecutors’ offer to dismiss charges against him in exchange for community service. Sefolosha’s attorney complained during the trial that authorities had not provided him in timely fashion with police documents that, when compared with video footage of the scene, appeared to contain false assertions. The judge subsequently told jurors that they could “infer” that the documents in question contradicted officers’ trial testimony.